Sometimes in life things sneak up on you. I remember the first time that I read Grace for the Good Girl by Emily P Freeman. When I picked up this book I would never have categorized myself as a "Try hard" person. I thought for sure I understood Gods Grace and how to live in it. By chapter two I realized I was utterly wrong and I was in for a wild ride over the next chapters, that ultimately lead me to freedom from my "try hard" tendencies. 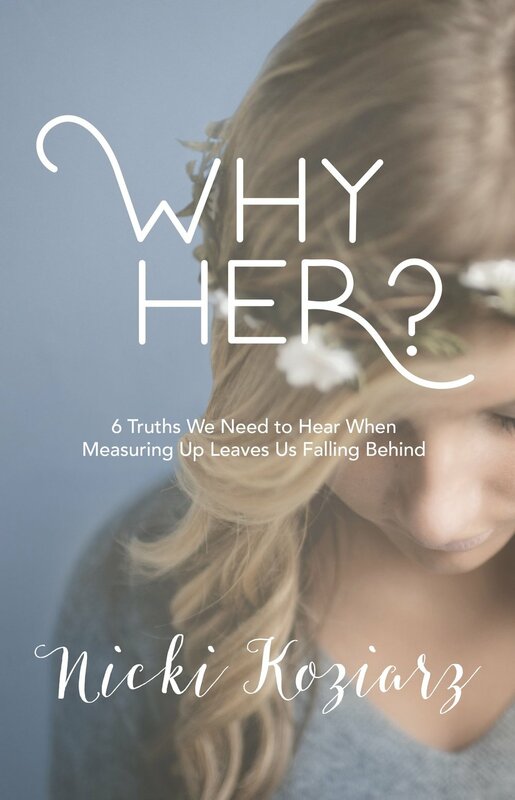 When I picked up Why Her, 6 Truths We Need to hear When Measuring Up Leaves Us Falling Behind" I had the same thought. "I don't struggle with comparison. I know who I am, I'm content in my life." But alas like many books on the subject of our identity I came to find that this is an area I have struggled with, though not in the ways that you might think. It goes to show, you can't judge a book by its subtitle and you may be surprised what a little self examination will bring to light! As women specifically I think we tend to struggle with comparison on a deep level that we often aren't even aware of. Nicki Koziarz, a wife, and mom to three girls has experienced a long struggle with this first hand and poured those struggles and the work thats gone into overcoming them into this book. By examining the biblical story of Rachel and Leah each section is comprised of two chapters that contain a truth to help us have victory over our comparison battles. 1. You need to be honest. 2. See it like it really is. 3. You don't always have to be ok.
4.Sometimes you didn't do anything wrong. 5.Her gain is not your loss. 6. Let the success of others encourage, not discourage you. In unpacking these truths and how we can apply them to our lives she asks the tough questions, about what or whom we are comparing ourselves to. The expectations we place on ourselves, and when was the last time we asked the Lord what our lives are really supposed to look like? He is the author after all, and as we know no two stories are exactly the same. Now I want to take a second to talk about style. This book has, at moments, what I would call a "Self Help" style, in part due to her terminology. Don't let that dissuade, you just be warned that if you are a reader and big fan of seasoned veterans like Elizabeth George or Nancy Leigh Demoss Wolgemuth you will find her language quiet different. Her points still come to biblical conclusions and we all know that that is what really matters at the end of the day. It's a writing style that is becoming increasingly popular and I have seen it in several of my favorite books lately but this one for some reason felt a little bit more difficult to navigate. So while each chapter wrapped up nicely I did find myself having to slow down and re-read sections for clarity and was often asking myself "Where is she going with this exactly?" BUT again so much of that has to do with preference and style. Some of you may pick this up and not even notice what I'm talking about. All that to say this was a good read and if you know or even suspect that comparison my be an issue in your life, something that's keeping you from thriving the way the Lord intends, you may want to grab a copy. Have a journal and pen ready, maybe some iced coffee and most defiantly a soft heart ready to see what the Lord will do.